Since this is the end of the year, I'm looking at movies that celebrated a major anniversary this year (20+ years). 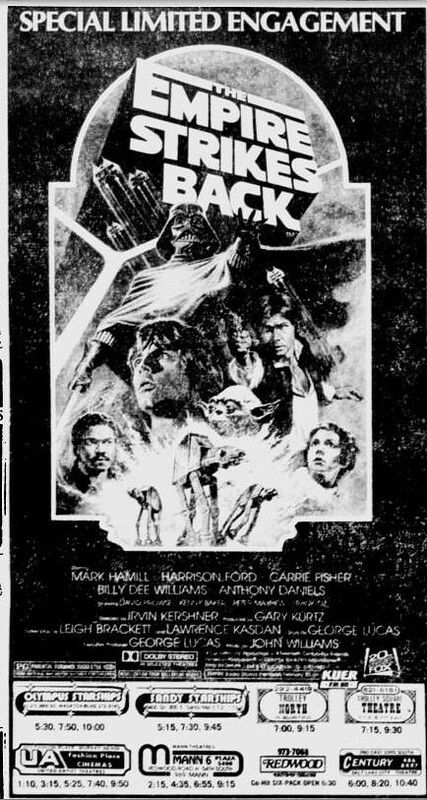 This is an ad for The Empire Strikes Back, which turned 30 years old this year. 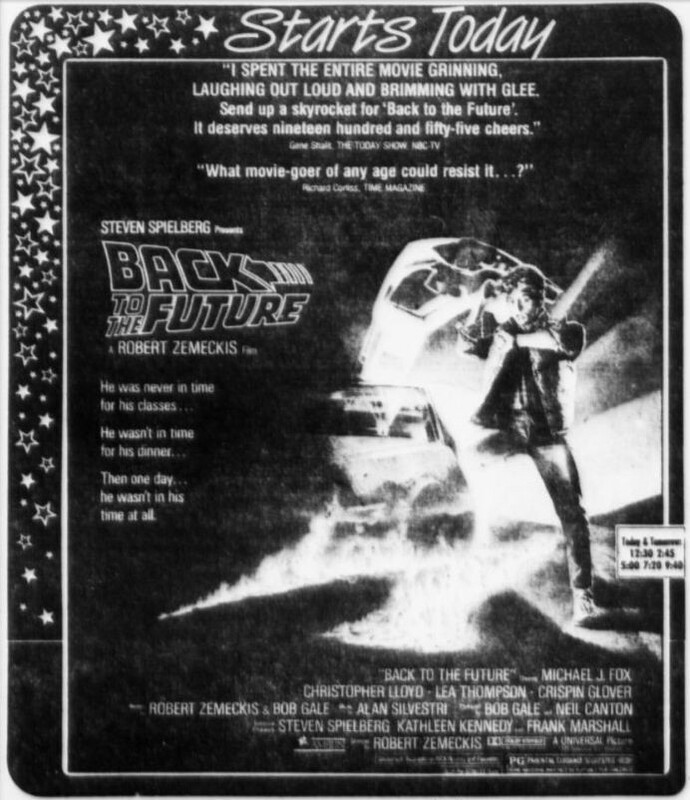 It was released on May 21, 1980, however this particular ad was from a re-release of the movie in November 1982. Yes, Empire was still playing in theaters TWO YEARS after its initial release. 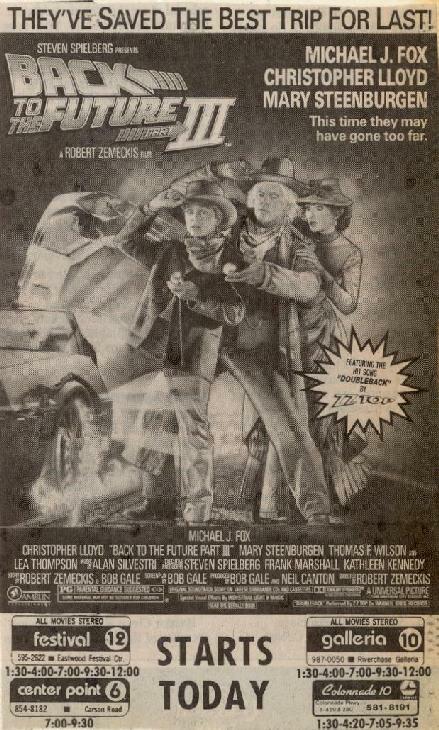 Continuing my look at movies that celebrated a big anniversary this year (20+ years), Back to the Future Part III turned 20 years old this year. This ad is from opening day, May 25th, 1990. 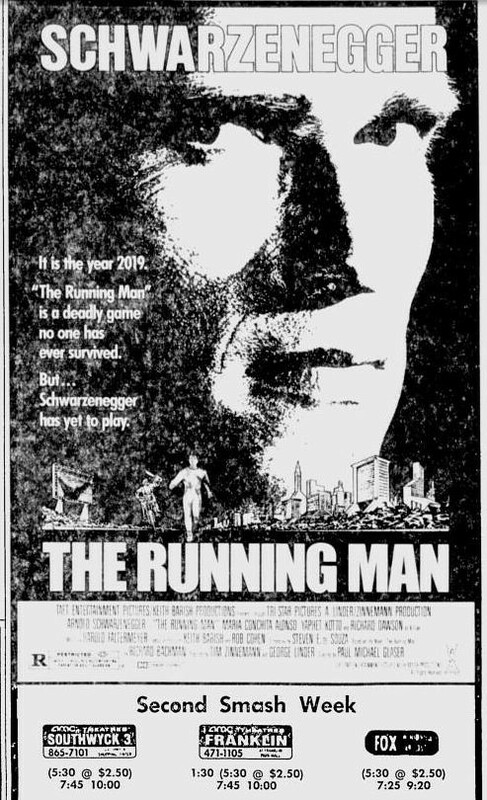 Finishing out my celebration of running my first marathon, here's an ad for The Running Man staring The Arnold. It's a pretty classic Schwarzenegger movie. Not bad and Richard Dawson puts in a great performance as Killian. I'm celebrating my first marathon this week by looking at movies featuring running (or just have RUN in the title). 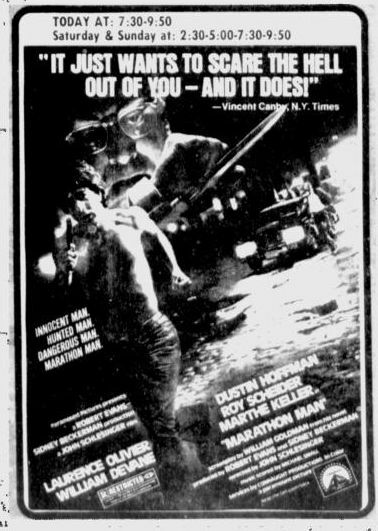 Today's ad is for the little remembered movie, Run starring "McDreamy", Patrick Dempsey, and "Mrs Travolta" Kelly Preston. Dempsey plays a college student is thrust into a high stakes poker game with a bunch of rough guys and, after winning a bunch of money, has a disagreement with one of the players who accidentally trips and dies when he hits his head on a table. Apparently the dead guy is the son of a big time mobster who now blames Dempsey for his son's death and Dempsey has no choice but to RUN...for his life. I caught this one time on cable and it's actually pretty good. More of an action-thriller vehicle for Dempsey who owned the romantic comedy genre in the late 80s. Unfortunately this movie never made it to DVD so it's really tough to find and/or watch despite the fact Dempsey is in the midst of somewhat a resurgence lately. Continuing the celebration of running my first marathon by looking at movies about running, today's entry is the classic thriller Marathon Man starring Dustin Hoffman and Sir Lawrence Olivier. Hoffman plays a graduate student who sees his brother murdered and is chased down by former Nazi dentist Szell (Olivier) who mistakenly believes Hoffman knows the whereabouts of some smuggled diamonds. While not specifically about running, Dustin Hoffman's character is, in fact, a marathon runner in the movie. Celebrating my first marathon this past Sunday so I am looking at movies about running, or just have RUN in the title. Today's movie is Running, starring Michael Douglas. Douglas plays a marathon runner who's so obsessed with going to the Olympics that his personal life falls apart. It's pretty good, but the end is brutal and heart wrenching and awesome all at the same time. I ran my first marathon yesterday. Well, first and probably only marathon. It was pretty tough. 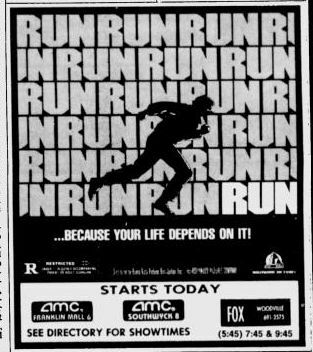 So to celebrate this accomplishment this week we are looking at movies and their ads that are about running. However, movies about running are a little scarce, so I'm also including some movies that have RUN in the title. 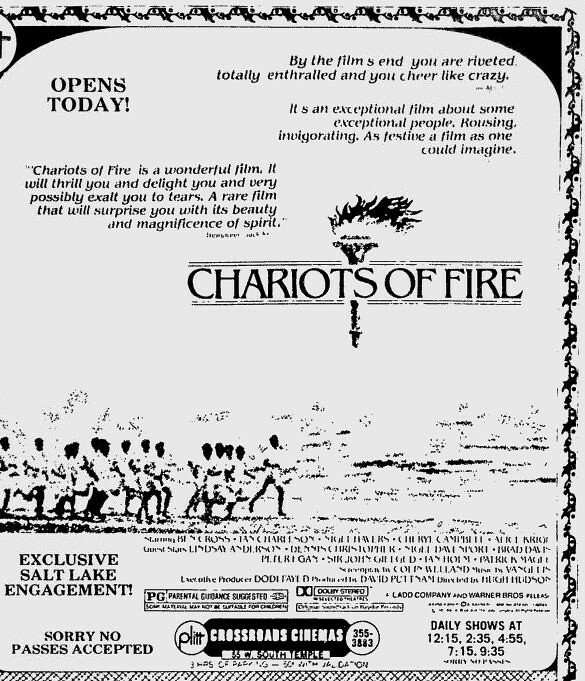 This is the ad for Chariots of Fire, famous for its theme song and how spectacularly boring it is. It's about two marathon runners competing in the 1924 Olympics. 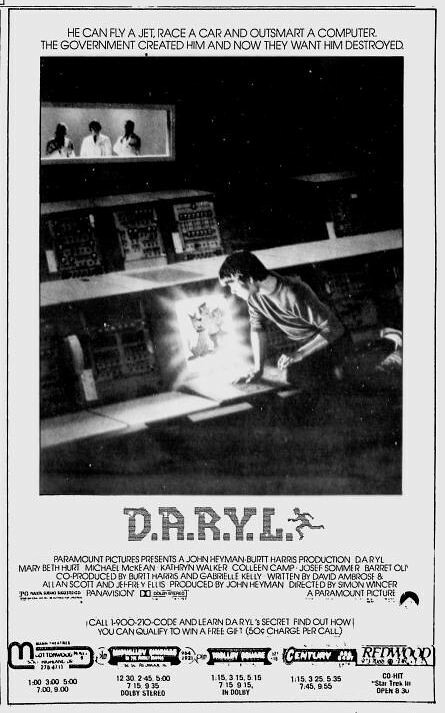 This ad appeared on Christmas Day, 1981. 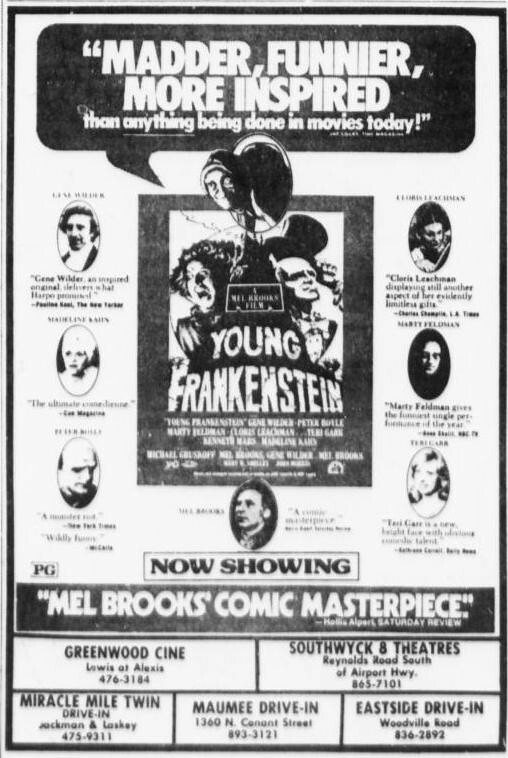 Continuing our celebration of Clue the Movie's 25th anniversary this week, here is an ad for Mel Brooks' brilliant Young Frankenstein starring Gene Wilder, Teri Garr and Madeline Kahn (Clue's Mrs White). This is Mel Brooks' parody of the Universal Frankenstein movies. Specifically, the movie mostly parodies the third film, Son of Frankenstein. 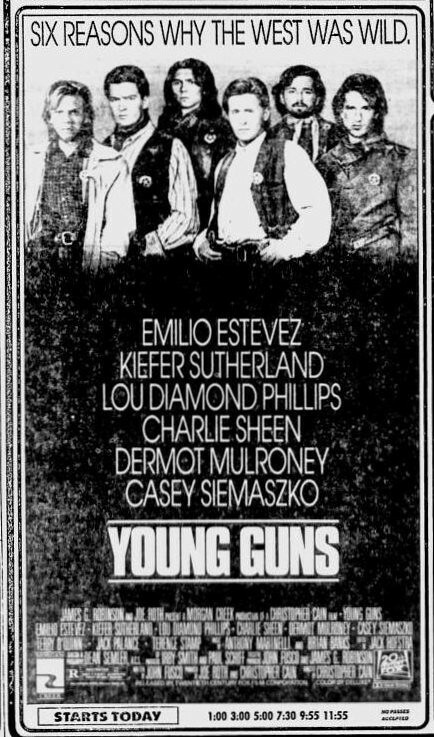 Interesting, this is the second movie ad I've featured that starred a Clue cast member as well as Teri Garr. The other one was Mr Mom. 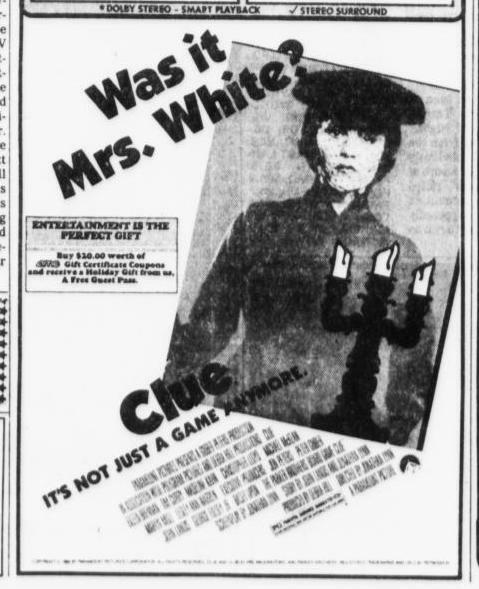 We are celebrating Clue the Movie's 25th anniversary this week. 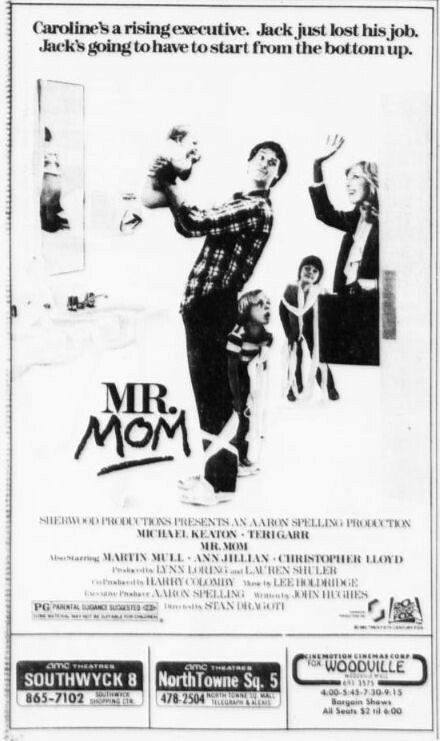 So here's an ad for Mr Mom which starred Michael Keaton, Teri Garr and Col Mustard himself, Martin Mull. 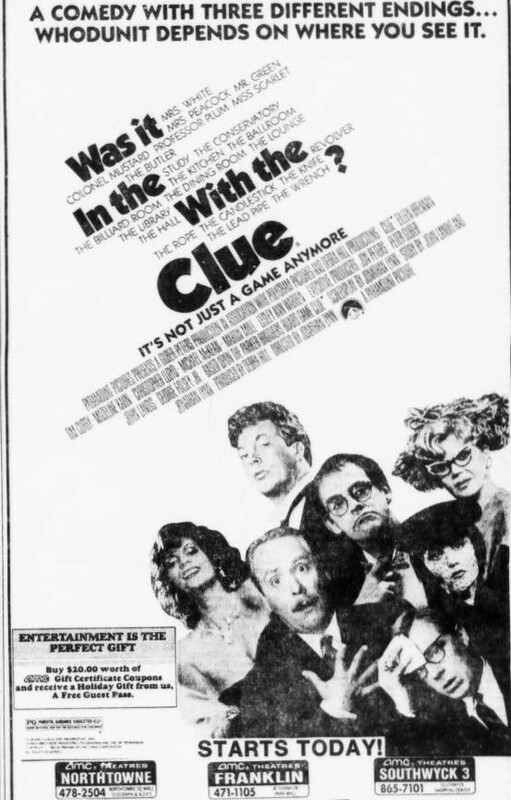 Clue the Movie started 25 years ago this week, so to continue the Clue theme here's an ad for Legend which famously starred Tim Curry (Wadsworth the butler) as Darkness.